Download "University of Connecticut Ph.D. 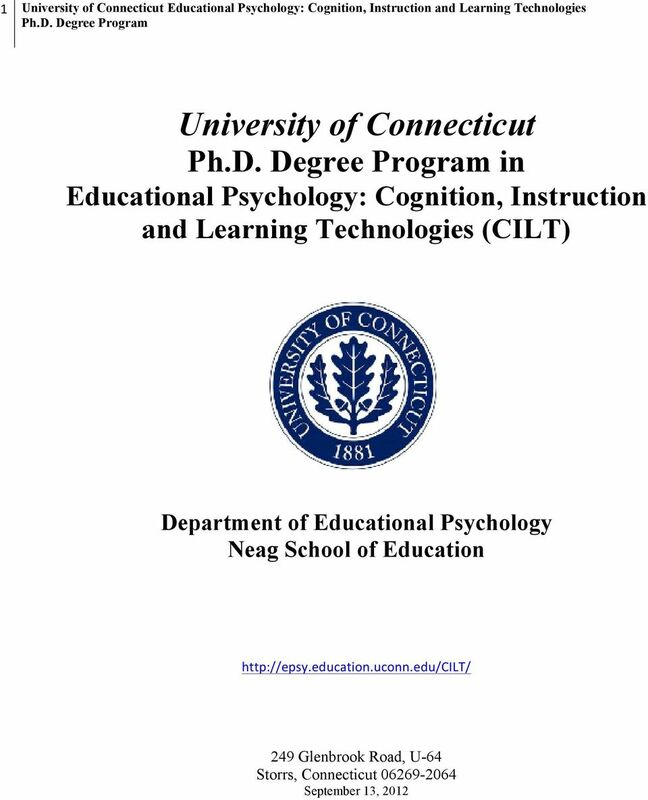 Degree Program in Educational Psychology: Cognition, Instruction and Learning Technologies (CILT)"
2 2 University of Connecticut Educational Psychology: Cognition, Instruction and Learning Technologies Department of Educational Psychology University of Connecticut The Department of Educational Psychology (EPSY) has a Ph.D. program in Educational Psychology: Cognition, Instruction and Learning Technologies. This graduate program is structured to prepare professionals whose primary interests involve issues of thinking and teaching. The Ph.D. program in Cognition, Instruction and Learning Technologies bridges the gaps among psychological theory, research, and educational practice. Core courses include theories of learning, cognitive processes, quantitative and qualitative research methods, learning technology, and instructional design. Research conducted by the CILT program is supported by the Neag Information Technology Laboratory with networked computers, a wireless environment, multimedia development capabilities, and support technology for research and instructional development (see ). Program Faculty and Research Interests Dr. Scott W. Brown Professor of Educational Psychology. Research Interests: Problem-based Learning; Learning Technologies; Memory Systems; Problem Solving; Decision Making, Learning and Assessment. Dr. Tutita Casa Assistant Professor of Educational Psychology. Research Interests: Elementary Mathematics Education; Preservice and Inservice Teacher Education; Discourse as an Instructional Strategy. Dr. Jae-Eun Joo Assistant Professor of Educational Psychology; Director of Neag Online Programs Research Interests: Online learning Dr. Donald J. Leu John and Maria Neag Endowed Chair in Literacy and Technology; Professor of Educational Psychology Research Interests: Cognitive and Instructional Issues Related to Literacy and Technology; New Literacies of the Internet; Elementary Reading Instruction. Dr. Jason M. Stephens Associate Professor of Educational Psychology. Research Interests: Human Motivation; Moral Reasoning; Academic Integrity; Civic Education. 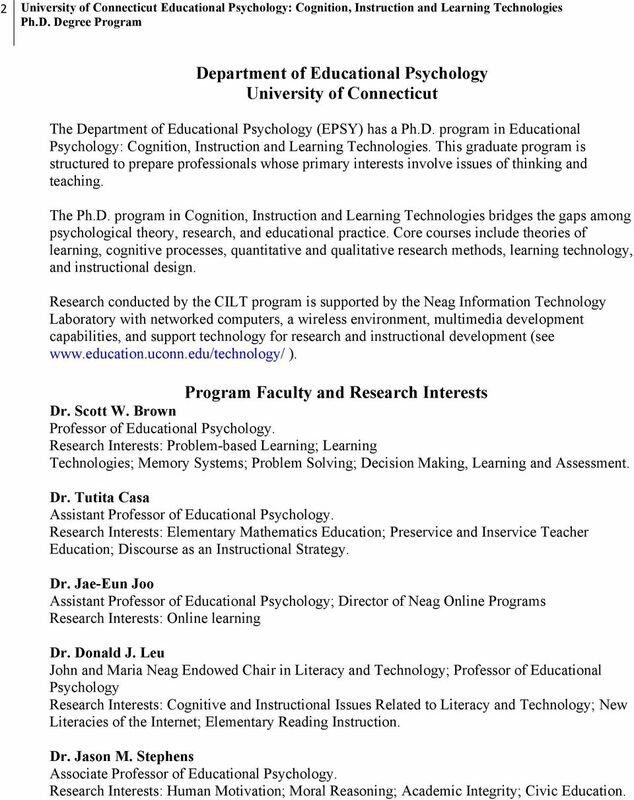 3 3 University of Connecticut Educational Psychology: Cognition, Instruction and Learning Technologies Dr. Michael F. Young Associate Professor of Educational Psychology. Research Interests: Situated Cognition as a Theory for Thinking and Learning; Development of Instructional Technologies; Log-File Analyses and Assessments. 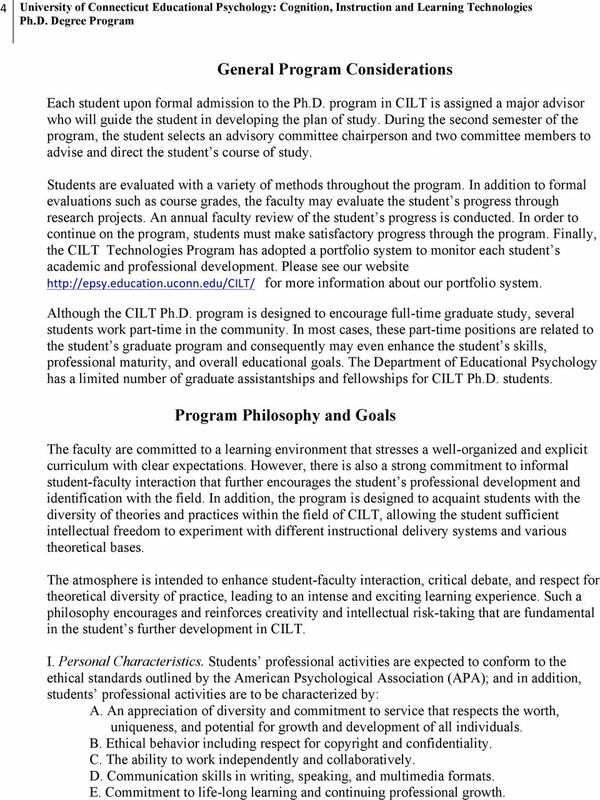 Admissions Admission to the doctoral program in Educational Psychology: CILT is a two-step process. First, the prospective student must submit a complete application to the University of Connecticut Graduate School. After receiving all components of the application, the Graduate School application is forwarded to program faculty for admission consideration. Completed applications must include an application form, receipt of current Graduate Record Examination (GRE) scores, undergraduate transcripts, and a processing fee. Additionally, each applicant must submit three (3) letters of reference discussing the applicant s abilities and skills. Forms are available from the Graduate Admissions Office, 438 Whitney Road Extension, Unit 1006, Room 108, Storrs, Connecticut More information is available in the graduate catalog and available online at Second, faculty in our program consider applications each spring for fall admission. The deadline for receipt of applications for consideration of admission for the fall semester is the previous February 15th. 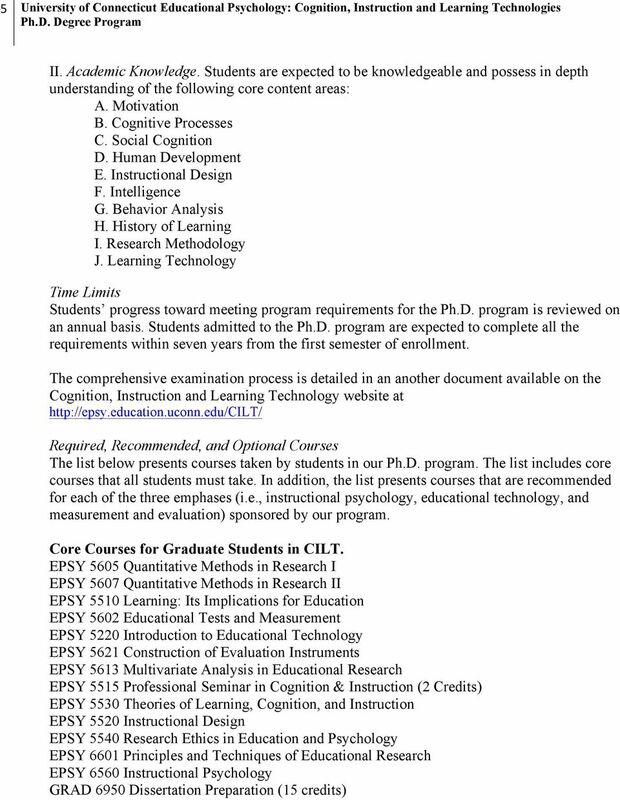 For program descriptions and further details about CILT or the Department of Educational Psychology, visit our website at Selection of Students General prerequisites for Ph.D. study include undergraduate preparation in psychology, education, or related disciplines. Any additional training and experience in Special Education, Anthropology, Sociology, or Human Development is desirable, but not mandatory. Multiple admissions criteria employed in the selection of students include Graduate Record Examination (GRE) scores, undergraduate or previous graduate course performance, letters of recommendation, previous relevant work experience, and, when possible, personal interview data. The CILT Faculty, the Department of Educational Psychology, and the Neag School of Education are committed to practices of affirmative action and equal educational opportunity in admissions decisions. The University of Connecticut is situated on a 3100-acre campus in Northeastern Connecticut. Assistance in securing either University or off-campus housing is provided by University agencies (e.g., Rental Properties Office, Room 107, Wilbur Cross Building, Unit 4022, Storrs, Connecticut ). 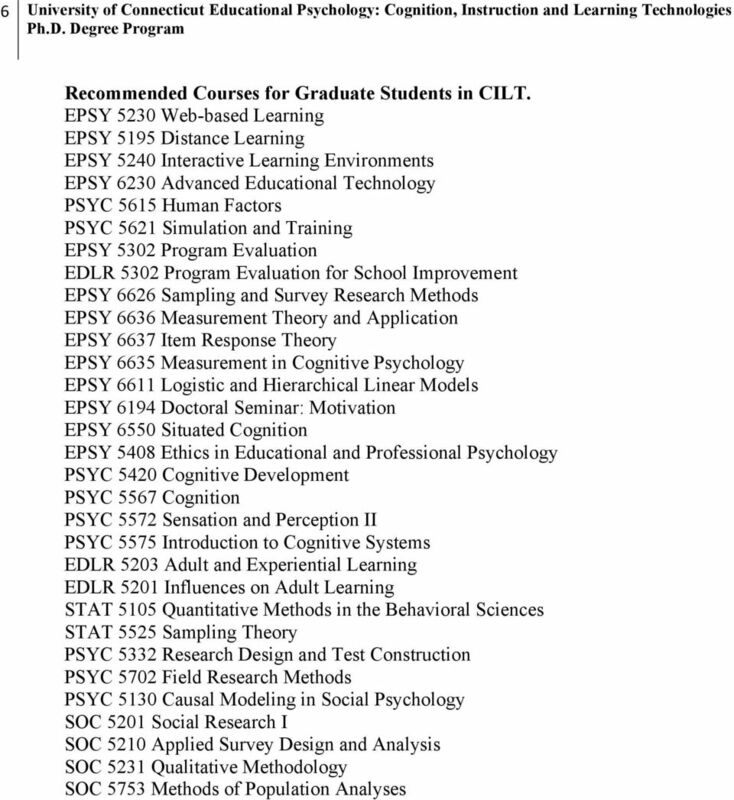 4 4 University of Connecticut Educational Psychology: Cognition, Instruction and Learning Technologies General Program Considerations Each student upon formal admission to the Ph.D. program in CILT is assigned a major advisor who will guide the student in developing the plan of study. During the second semester of the program, the student selects an advisory committee chairperson and two committee members to advise and direct the student s course of study. Students are evaluated with a variety of methods throughout the program. In addition to formal evaluations such as course grades, the faculty may evaluate the student s progress through research projects. An annual faculty review of the student s progress is conducted. In order to continue on the program, students must make satisfactory progress through the program. Finally, the CILT Technologies Program has adopted a portfolio system to monitor each student s academic and professional development. Please see our website for more information about our portfolio system. Although the CILT Ph.D. program is designed to encourage full-time graduate study, several students work part-time in the community. In most cases, these part-time positions are related to the student s graduate program and consequently may even enhance the student s skills, professional maturity, and overall educational goals. 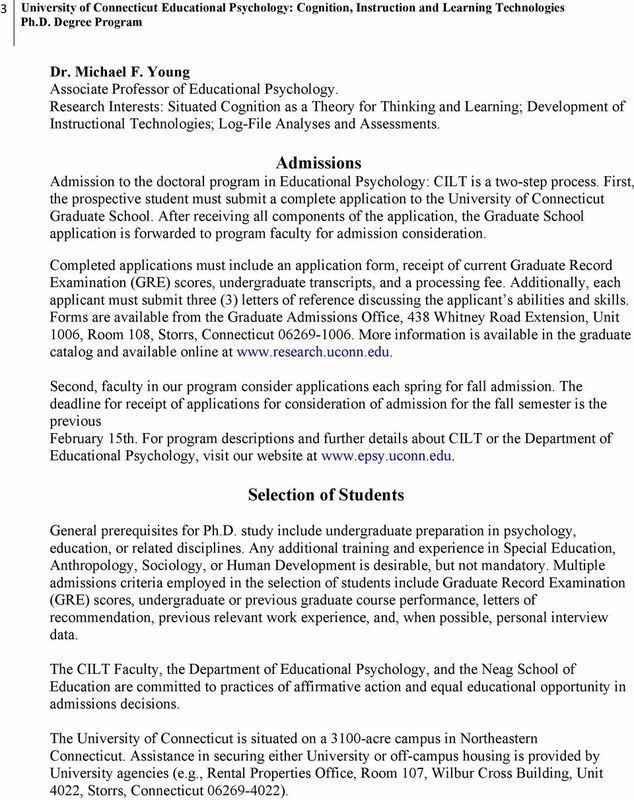 The Department of Educational Psychology has a limited number of graduate assistantships and fellowships for CILT Ph.D. students. Program Philosophy and Goals The faculty are committed to a learning environment that stresses a well-organized and explicit curriculum with clear expectations. However, there is also a strong commitment to informal student-faculty interaction that further encourages the student s professional development and identification with the field. In addition, the program is designed to acquaint students with the diversity of theories and practices within the field of CILT, allowing the student sufficient intellectual freedom to experiment with different instructional delivery systems and various theoretical bases. The atmosphere is intended to enhance student-faculty interaction, critical debate, and respect for theoretical diversity of practice, leading to an intense and exciting learning experience. Such a philosophy encourages and reinforces creativity and intellectual risk-taking that are fundamental in the student s further development in CILT. I. Personal Characteristics. Students professional activities are expected to conform to the ethical standards outlined by the American Psychological Association (APA); and in addition, students professional activities are to be characterized by: A. An appreciation of diversity and commitment to service that respects the worth, uniqueness, and potential for growth and development of all individuals. B. Ethical behavior including respect for copyright and confidentiality. C. The ability to work independently and collaboratively. D. Communication skills in writing, speaking, and multimedia formats. E. Commitment to life-long learning and continuing professional growth. UNIVERSITY OF CALIFORNIA, SANTA CRUZ. Education Department, Ph.D. Program. Ph.D. Program in Education. Program Features.